IPL is short for intense pulsed light. It is a popular treatment that is best-known for its ability to treat vascular conditions like broken capillaries ("spider veins") and the brown spots or "age spots" caused by sun damage. IPL uses short blasts of a polychromatic, high-intensity light to penetrate just below the skin's surface, damaging either the melanin that makes up brown "age spots" or the blood vessels that create broken capillaries. The skin repairs the damage, leaving you with a more even skin tone with little to no down time. 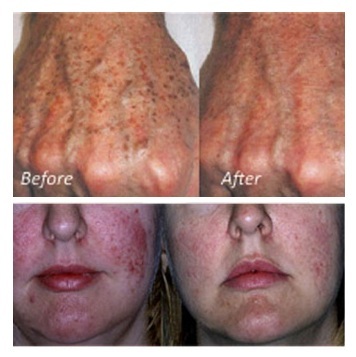 IPL treatment also boosts collagen and elastin. The ideal candidate for IPL is someone with light skin who has sun damage, broken capillaries, and some laxity or lack of firmness. It generally takes a series of treatments to see the best results, perhaps three to six treatments, usually a month apart. Post treatment the client should use sun block with SPF of at least 30 daily and wear a hat if out in the sun. SPF with zink ozide is rocommended. The client should not have any sun exposure 4 weeks prior the treatment as well as 4 weeks after the treatment.